Even though the calendar says Spring, Mother Nature is still not cooperating. So, I am cooking and baking like it's Spring. Remember, Spring is a state of mind, in Chicago. Lemon is another wonderful flavor that speaks "Spring" to me. The bright sunny color of luscious lemons, gives any any recipe a ""pop" of flavor. I had blueberries in the freezer, and wanted to make these scones .Even though I didn't defrost the blueberries, and gently folded then in, they still bled a little bit. How do you keep your blueberries from bleeding through in your baked recipes.? They looked a little blue, when they came out of the oven, so I thought I would make a lemon glaze to put over them, dress them up a bit, and give them a little lemon zest as well. The lemon glaze goes so well with the blueberries, and now they actually look quite sunny, don't you think? They are the only sun, that we will be seeing for awhile, according to the weather station. I got this recipe from Mary Beth Manfredini, the wife of Lou Manfredini, Mr. Fix-It. Lou gives home repair and maintenance information, as well as his wife's recipes, on NBC's today Show, and his weekly radio show on WGN Radio in Chicago.. The scones were so easy to make, and you could easily double the recipe. The scones are so soft and tender inside, they almost melt in your mouth. This a very versatile recipe and you could use almost any fresh or dried fruit, nuts, even Nutella:) I'll have to try the Nutella next! Combine powdered sugar and lemon juice and zest in small bowl, Mix until well combined. Spread over scones, and garnish with glaze. I am happy to report that the Bride finally found a dress, several days after went shopping with the Bride and her Mom. She wanted to go back to the first place she went to try on a dress again. It happened that the Bridal shop was having a trunk show that weekend, and a dress, that she had never seen before and fell in love with, came in early. It was pure fate. Now, the Bride found "The Dress". I always enjoy dropping by for a visit Becky! These scones are delightful, versatile and ohhh so easy to make. I'm taken by the luscious dollop of cream atop the very blueberry scones. The sprinkle of zest is the sparkly golden crown. Beautiful! Katrina-These scones are very good, especially with tea. Brooks-Thank you for your comments and support. I really appreciate them. Mateja- These scones are so easy to make, and so good. You could use chocolate chips, any kind of dried or fresh fruit-so versatile. Let me know how they turn out, if you make them. just found your site on foodbuzz. looks great and I love a good blueberry scone, yum!! Elizabeth- Thanks for stopping by. Hope to see you back again! Susi- Thank you for your kind words! Lovely scones! What a delicious combination. I love scones and your blueberry scones sound so good. would love few with my tea in the morning. 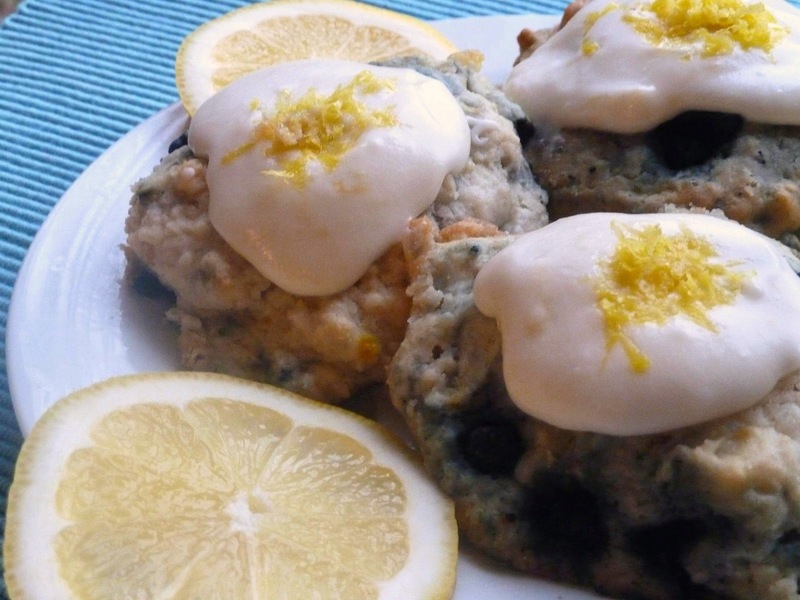 A lovely combination of citrus flavor glaze with bluberry scones! Scrumptious for sure! Thank you all for the wonderful comments. I certainly appreciate them:) Happy Friday everybody! Hi Becky! Oh the lemon glaze looks so perfect. What a simple yet satisfying recipe. Thank you for sharing it with me. And thank you for all your kindness...it means more to me than I can express. What a week it has been! How did I miss this recipe? You know me and my scone love! I'm copying this down now and can't wait to make it. As far as your question: Cubbies all the way. Though the Sox farm team is located here and the Sox were just here playing them (and lost).